On this page, you will find a simple overview of the steps you must take to get a contractor's license from the Arizona Registrar of Contractors. If at any time you have a question and the answer is not provided below, give us a call at 877.692.9762 or email ROC Licensing staff at [email protected]. The Applicant must identify a Qualifying Party for the license. A Qualifying Party is a regularly employed person with the necessary experience, knowledge and skills as defined under A.R.S. § 32-1122(E). The Qualifying Party must meet or exceed the license classification requirements for the license classification for which they are applying. The License Classification Requirements form provides the minimum number of years of experience and the types of examinations required for a Qualifying Party to be eligible for a specific license classification. The Qualifying Party must pass the required examinations by at least 70% and submit the exam results. The Qualifying Party must complete a business management exam (BME) and a specific trade exam, unless eligible for a waiver. • To determine which exams are required for a specific license classification, refer to License Classification Requirements. • The Qualifying Party can register to take an exam through PSI Exams Online. • For information about PSI’s Business Management test, refer to PSI's Candidate Information Bulletin. • For information about PSI’s Trade Exams (when needed), refer to PSI's Trade Exam Information. The Applicant and Qualifying Party must submit copies of the payment transaction receipt from their background checks. Click here to learn more and to submit a background check. Form or register your legal entity at the Arizona Corporation Commission (if necessary). In Arizona, a license may be issued to a sole proprietorship (individual), a partnership, limited liability company or a corporation. To learn more about creating the appropriate entity for you and obtain the required documentation, visit the Arizona Corporation Commission's eCorp website for additional information. The applicant must obtain and submit proof of a license bond. For information on determining bonding requirements and to download a comprehensive list of all businesses licensed to offer surety products in this State by the Arizona Department of Insurance, visit our bond information page. Include the required fees and assessments with your License Application form. Both the Applicant and the Qualifying Party in this License Application must submit a copy of their government-issued identification with the application. Acceptable forms of identification include a valid driver’s license or passport. Before you submit your application packet to the Arizona Registrar of Contractors, you must make sure that your application packet includes all of the parts in the checklist below. Click on items to see or hide detail information. The Qualifying Party’s original exam results, or a completed waiver form. Copies of the payment transaction receipt from the background check for every person named on the License Application Form. A copy of the legal entity’s papers. Each License Application Form contains specific requirements depending on the legal entity. Completed original Bond Verification Form. The required application fee and licensing fee. Every individual named in Part 3: Persons in this License Application must submit a legible copy of a government issued photo identification with the application. Acceptable forms of identification include a valid driver’s license or passport. Completed Signatures section of the application. If any person named on the License Application Form was named on a prior license, complete and attach a Prior License Disclosure Form for each person. Also include forms and documentation of disciplinary resolution, if applicable. If you currently have a license that you wish to cancel upon the issuance of a new license, complete and attach a License Cancellation Form. If any person named on the License Application Form was charged with or convicted of a felony, complete and attach a Felony Disclosure Form for each person. If any person named on the License Application Form was convicted of unlicensed activity, complete and attach an Unlicensed Activity Disclosure Form for each person. and documentation of remedial measures. To obtain a restricted license approval an Applicant must have prior written approval from the Registrar. The Applicant must submit the letter from the Registrar approving a “restricted license,” if applying for a restricted license. A copy of the solar warranty (if you are applying for a solar license). Click on questions to see or hide answers. Who can apply for a contractor's license? A sole proprietorship (individual), a partnership, limited liability company, or a corporation may apply for a contractor's license if they have a regularly employed person with the necessary experience, knowledge and skills who serves as the qualifying party. All persons listed on the application must be 18 years of age or older. A corporation or limited liability company must be registered with the Arizona Corporation Commission and in good standing with that agency before submitting an application for a contractor's license. The corporation or limited liability company must remain in good standing in order to renew their contractor's license. Who is responsible for contracting activities? All persons listed on the license are responsible for the contracting activities of the business. "Person" means a qualifying party, an owner, any partner of a partnership, all members of a limited liability company, and any officer, director or owner of 25 percent or more of the stock of a corporation. Who must be licensed as a contractor? Any business which contracts or offers to contract to build, alter, repair, add to, subtract from, improve, move, wreck or demolish any building, highway, road, railroad, excavation or other structure, development or improvement, or to do any part of the work must be a licensed contractor. Also included in work requiring a license is the erection of scaffolding, connections to utility service lines, metering devices and sewer lines, mechanical or structural service to a structure or improvement and any other work in connection with the project. Supervision or management includes hiring and firing of specialty contractors, scheduling of work on the project, and selection and purchasing of construction material. To whom is the license issued? 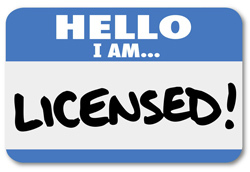 A license may be issued to a sole proprietorship (individual), a partnership, limited liability company or a corporation. The license belongs to the business and not to the qualifying party. Passing a trade examination is one of the requirements necessary to be approved for a contractor’s license. A trade examination helps the ROC assess whether an applicant has the knowledge required to perform the type of work authorized by a license. However, pursuant to R4-9-106(D) the Registrar may decide to waive the trade exam requirement under specific circumstances. * The Business Management examination cannot be waived because it has reference to Arizona specific statutes and rules. ** The ROC cannot waive the Arizona Department of Water Resources Trade Examination required for the A-4, A-16, C-53, and R-53 license classifications. What information must be submitted when requesting a waiver for a trade examination? Complete and submit the Application to Waive a Trade Examination. To whom does the term "qualifying party" refer? The "qualifying party" means a person who is regularly employed by the licensee and is actively engaged in the classification of work for which the person qualifies in behalf of the licensee. The qualifying party must have the necessary experience, knowledge and skills to supervise or perform the contracting work. Who can be a qualifying party? The qualifying party may be a sole proprietorship, one of the partners of a partnership, one of the members of a limited liability company, one of the officers of a corporation or an employee of the contracting business. What is the qualifying party required to do? They are the responsible managing employee. While engaged as a qualifying party for a licensee, the qualifying party shall not take other employment that would conflict with his duties as qualifying party or conflict with his ability to adequately supervise the work performed by the licensee. Can the same person serve as the qualifying party for more than one entity? The qualifying party owns at least 25 percent of both businesses. One licensee is a subsidiary of another licensee for which the same person acts in a qualifying capacity. "Subsidiary" as used in ARS 32-1127(2) means a corporation of which at least twenty-five percent is owned by the other licensee. Will the Arizona Registrar of Contractors acknowledge receipt of my application? Yes. You will receive a receipt with a pending number on it. This number is used to keep track of your application. If you have questions on the status of your application, you may use the pending number when calling in so that your application can be located more quickly. When the application is approved, a notice is mailed to you. If your application can not be approved, you will be notified. Can I get a refund of the fees? The Agency returns the license fee when a license is not issued. Such instances include, when an application is returned because the applicant failed to respond to a deficiency letter by providing requested information or when the applicant makes a request to withdraw their license application. The application fee is retained, however. The Agency returns the application fee when the Agency exceeds the statutorily allowed timeframe to review and act upon a license by issuing or denying the license application. Note: This statutory timeframe does not include time the Agency is waiting on the applicant to respond to deficiencies. The license fee is retained, however. The only time the Agency would refund the application fee and license fee would be on a denied license that took longer than 60 days to review and act upon the license. Is a bankruptcy a reason to deny an application for a contractor's license? A bankruptcy is not grounds to deny an application for a contractor’s license. If the ownership of a business changes, is the contractor's license considered to be part of the business? No, a license is non-transferable, with the possible exception of a corporation or limited liability company. If stock is sold and the file number assigned by the Arizona Corporation Commission remains the same, the same license can be used if the license is active and in good standing. How do I apply for a Federal Employer ID Number / Tax ID Number? Federal Employer ID Numbers (EIN) / Tax ID Numbers (TIN) can be obtained through the IRS.gov website at the following address. Read their directions carefully and fill out the online application to immediately receive your EIN.